Background and objectives: Transplantation should favorably affect coronary calcification (CAC) progression in dialysis; however, changes in CAC score in the individual patient are not reliably evaluated. Design, setting, participants & measurements: The authors used special tables of reproducibility limits for each score level to study, by multislice computed tomography and biochemistries, the 2-year changes in CAC in 41 transplant patients (age 48 ± 13 yr, 25 men, dialysis vintage 4.8 ± 4.3 yr, underwent transplant 6.2 ± 5.5 yr prior). Thirty balanced dialysis patients served as controls. Results: In the study group, Agatston score was stable, and C-reactive protein decreased, whereas fetuin and osteoprotegerin increased. In the control group, Agatston score increased, parathyroid hormone and phosphate decreased, and inflammation markers were persistently twice as high as in the study group. With regard to individual changes, 12.2% transplant patients worsened, compared with 56.6% of patients in dialysis (P < 0.0001). Patients without calcification at entry showed slower progression in transplantation (8.3%) than in dialysis (44.4%; P < 0.034), and the difference was similar to that observed in cases with CAC (17.6% versus 61.9%; P < 0.007). Discriminant analysis indicated parathyroid hormone, the modality of therapy (dialysis or transplantation), and erythrocyte sedimentation rate as the variables most associated with worsening. Conclusions: Renal transplantation lowers but does not halt CAC progression. Inflammation and hyperparathyroidism are associated with progression in the populations studied. After the introduction in clinical practice of electron beam computed tomography (EBCT), a disturbing tendency in the progression of coronary artery calcium (CAC) content has been evidenced in dialysis patients (1). This phenomenon is commonly attributed to the coexistence in uremia of several pathogenetic factors of vascular calcification, such as derangements of divalent ions metabolism, circulating levels of inhibitory proteins of calcification and inflammation (2–6). Hypothetically, in renal transplant patients, who almost invariably experience an improvement of all these factors (7–9) a stabilization or even a regression of CAC should occur, but available data are insufficient and not uniform (10–12). When evaluating the time-related changes in CAC, a significant and neglected problem is the reproducibility of the scanning technique. In fact, the variability of two consecutive tests has been reported to range between 11% and 28% for EBCT (13–16) and more significantly, between 18% and 43% for the more recently developed multislice computed tomography (MSCT) (13,17,18). However, variability can be improved by standardization of scanning and reading protocols, which result in interscan variabilities of 16.9% and 15.8%, respectively, with EBCT and MSCT (19). Nonetheless, even with standard protocols, the calcification scores suffer from an unavoidable measurement error directly proportional to the magnitude of the value obtained (20,21). This variability must be taken into account when interpreting CAC score changes in a given patient. To overcome these limitations Sevrukov et al. (22) recommend that for any given baseline measure of CAC, progression is determined to occur if the repeat value exceeds the upper 95% confidence interval for that baseline value on the basis of known reproducibility testing. In the present study, time-related changes in CAC scores and biochemical variables were examined in stable transplant recipients and a matched cohort of dialysis patients. We planned to evaluate CAC progression by means of two timed MSCT scans in a population of renal transplant patients who, at the beginning of the study, were older than 18 yr, had received transplants at least 6 months previously and were in stable clinical condition, and were receiving standard immunosuppressive therapy. In particular, we excluded patients in the early post-transplant period because of the heavy pharmacologic burden, immunologic instability, and metabolic disequilibrium linked to acute renal tubular dysfunction, which are typical of this period and which could potentially affect the planned biochemical evaluations. A total of 51 patients (age 45.5 ± 12 yr, 30 men, 21 women) who had received transplants 6.5 ± 5.5 yr previously and who spent 4.8 ± 4.3 yr on dialysis agreed to participate in the study. Causes of renal insufficiency included glomerulonephritis in 22 patients, tubulointerstitial nephritis in 11, polycystic kidney in four, nephroangiosclerosis in three, renal hypoplasia in one, and unknown in 10. Besides MSCT, a blood sample was drawn for serum creatinine, albumin, calcium (Ca), phosphate (P), parathyroid hormone, erythrocyte sedimentation rate (ESR), C-reactive protein (CRP), fibrinogen, fetuin, and osteoprotegerin (OPG). Taking into account the available data on the progression of CAC in dialysis, we selected a minimum interval of 18 mo as adequate to observe possible changes. Accordingly, patients were requested to repeat the study, but only 41 could comply. In fact, during the interval, one patient died, five experienced deterioration of renal function requiring dialysis, one moved to another city, and three refused further participation. During this period, patients were treated according to the standard immunosuppressive protocols, including steroids (34 patients), calcineurin inhibitors (40), antimetabolite (27) and anti-mTOR compounds (three). Moreover, in addition to antihypertensive drugs, they also received either statins (14), vitamin D (seven), or phosphate supplements (one). The control group, predictably with modification of CAC, was selected from wait-listed dialysis patients. Previous history of transplant failure and dialysis duration of less than 6 months were major exclusion criteria. Enrollment was aimed at balancing cases according to age, gender, dialysis duration, prevalence of diabetes, and causes of cardiovascular disease (defined as previous stroke, myocardial infarction, or coronary or peripheral vascular surgery). On the basis of these criteria, 49 patients (age 49.5 ± 14 yr, 30 men 19 women) who had been on dialysis for 5.6 ± 4.8 yr were enrolled and underwent MSCT and blood sampling for all of the above-mentioned parameters, except for serum creatinine. Causes of renal insufficiency included glomerulonephritis in 24 patients, tubulointerstitial nephritis in seven, polycystic kidney in three, nephroangiosclerosis in three and unknown in 12 (χ2 = NS as compared with transplant group). After no less than 18 mo, they were requested, as with the transplant patients, to repeat the study, and 30 were able to comply, while five died, six received a transplant, three moved to another city, and five refused the new control. Treatment during this period was left to the discretion of the dialysis center. Patients were treated with phosphate binders (25 patients), oral (18) or i.v. (three) vitamin D, calcimimetics (three) and statins (seven). Reasons for patient withdrawals were balanced between the two study groups, and no statistically significant difference was evident (as for age, gender, BMI, dialysis duration, prevalence of disease, and other evaluated parameters) between the enrolled populations of patients before and after completing the protocol. This result points to the absence of any important selection bias. All patients were scanned using Somaton Sensation 64-slice CT scanner (Siemens Medical Solutions, Forchheim, Germany) MSCT (Somaton Volume Zoom; Siemens, Erlangen, Germany) with the following scanning parameters: 30 × 0.6 mm collimation; slice thickness 3 mm; 120 kV, 100 mA, 1.4 s gantry rotation time, and prospective ECG triggering at 70% of R-R interval. The entire heart was covered in a single held breath (15 to 20 s). The mean effective dose for both male and female patients was <1.3 mSv. All images from MSCT were transferred to a dedicated workstation (Vitrea2 Vital, version 3.9.0.0, Minnetonka, MN) and Agatston and volume score (AS and VS, respectively) were calculated. With a dedicated cardiac software, all pixels with density >130 H were automatically highlighted in color on the images. The radiologist assigned one out of five locations to each calcified plaque: left main, left anterior descending, circumflex, right coronary artery, or posterior descending artery. According to the Agatston method, as previously reported, we defined the regions of interest by vessel and slice with the threshold option for pixels greater than 130 H to measure the area and peak density of plaques. Depending on the peak density of the plaque, an area of at least 0.52 mm2 (2 pixels) was multiplied by one of the following cofactors: 1 for 130 to 199 H, 2 for 200 to 299 H, 3 for 300 to 399 H, and 4 for densities greater than 400 H. The total CAC score was calculated as the sum of the individual lesion scores in all coronary arteries with the two specific equations (23) for AS and VS.
To determine whether the first CAC value was different from the second, we referred to the tables reported in the paper by Sevrukov et al. (22), in which the repeatability coefficient and the repeatability limits for each level of score are reported. As an example, according to these criteria, 95% of repeatability limits for an AS of 100 is estimated to range between 51 and 149, and the second scan can be considered different if it is <51 or >149 (±49%). As a comparison, in these tables, 95% of repeatability limits for AS values of 500 and 1000 range between 390 and 610 (±22%) and between 844 and 1156 (±15.6%), respectively. Moreover, because these tables are obtained from a nonuremic population and include a maximum score of 3000, we adopted the same limits of maximum score in four subjects (two in dialysis and two who had received transplants) who showed higher values. Thus, despite a lower sensitivity for progression, we achieved a higher level of diagnostic reliability. Serum levels of creatinine (kinetic alkaline picrate method), albumin (bromcresol purple method), Ca (cresolphthalein complexone method), P (ammonium molybdate method), CRP (immunoturbidimetric with specific antibody, Abbott; n.v. <0.9 mg/dl), and fibrinogen (turbidimetric, Dade-Behring; n.v. 200 to 400 mg/dl) were assayed by standard, automatic techniques with a Technicon RA-500 analyzer. ESR was evaluated with standard heparin prefilled tubes (Westergren method; n.v. <20 mm/h). PTH was assayed by an immunoradiometric technique, based on a double antibody against the intact molecule; our normal values are within 10 to 55 pg/ml, with intra- and interassay variations of 6.5% and 9.8%, respectively. Serum fetuin was assayed with a two-site sandwich ELISA technique (EDI Human ELISA kit, Epitope Diagnostics, San Diego, CA) using two selected goat anti-human fetuin-A polyclonal antibodies, binding to different epitopes of human fetuin-A. The lower limit of detection is 0.025 g/L, with intra- and inter- assay coefficient of variations of 5.5% and 6.25%, respectively. Our normal values are 0.59 ± 0.1 g/L. Serum OPG was assayed with a sandwich ELISA (Biomedica Gruppe, Wien, Germany), which uses two polyclonal antibodies binding to two different epitopes of the molecule. The lower limit of detection is 0.14 pmol/L, with intra and inter-assay variations of 6.0 and 7.2%, respectively. Our normal values are 2.3 ± 0.6 pmol/L. Descriptive statistics, as well as confidence intervals, statistical tests and discriminant function analysis were performed with STATISTICA software package (StatSoft 1995). Confidence interval for a proportion was computed by Clopper-Pearson's exact method; the difference between the two proportions was evaluated according to Fisher's exact probability or by χ2 test to see if the number of proportions was higher. Statistical difference between two samples of data were obtained by Wilcoxon's test (paired data) or the Mann-Whitney U test (unpaired data); finally, discriminant analysis was performed using the standard model adopted in STATISTICA (24,25). Basal clinical characteristics of the two population of patients who completed the study are compared in Table 1. The study group patients had received transplants, on average, 6.2 ± 5.5 yr previous (range 0.5 to 20). Data of CAC scores and biochemistries of patients at the first and second study, separately for transplantation and dialysis, are reported in Table 2. In the study group, (see also Figure 1, where individual values are shown), AS averaged 660 ± 1812 at entry and reached 698 ± 1830 (NS) after a mean of 25 ± 4 mo, and VS was substantially the same (570 ± 1505 versus 576 ± 1496; P = NS). Serum levels of Ca (9.9 ± 0.9 versus 10.2 ± 1.1; P = NS) and P (3.3 ± 0.9 versus 3.3 ± 0.8; P = NS) were stable, and PTH dropped from 152 ± 161 to 93 ± 92 pg/ml (P < 0.0002). As for inflammation markers, ESR and fibrinogen were unchanged (17.7 ± 14.3 versus 16.9 ± 18.5, P = NS, and 347 ± 73 versus 385 ± 99 mg/dl, P = NS, respectively), whereas CRP reached normal values from 0.54 ± 0.82 to 0.28 ± 0.32 (P < 0.001). The inhibitory proteins of calcification, fetuin and OPG, increased from 0.49 ± 0.14 to 0.66 ± 0.13 g/L (P < 0.00001) and from 3.8 ± 1.5 to 5.7 ± 2.5 (P < 0.00001), respectively. Individual values of Agatston score at entry and after approximately 2 yr, in the two groups of patients. In the control group, after a mean interval of 24 ± 3 mo, AS increased from 1356 ± 3471 to 1703 ± 4601 (P < 0.0006; Figure 1) and VS from 1146 ± 2813 to 1359 ± 3587 (P < 0.02). In this group, serum Ca remained stable (9.3 ± 0.8 versus 9.9 ± 1.5 mg/dl, P = NS), whereas P and PTH fell (from 5.5 ± 1.9 to 4.6 ± 1.2 mg/dl; P < 0.02; and from 428 ± 385 to 242 ± 288 pg/ml; P < 0.004, respectively). On the contrary, no modification was evident for ESR (36 ± 22 versus 33 ± 22; P = NS), CRP (1.95 ± 3.2 versus 1.3 ± 1.2; P = NS), fibrinogen (391 ± 117 versus 417 ± 70; P = NS), fetuin (0.45 ± 0.16 versus 0.51 ± 0.15 g/L; P = NS), and OPG (11.7 ± 4.9 versus 10.6 ± 3.2; P = NS). Table 2 shows that despite clinical comparability, the two groups had different baseline mean values of AS (P < 0.005), VS (P < 0.01), P (P < 0.000001), PTH (P < 0.0009), ESR (P < 0.00001), and OPG (P < 0.0000001). This difference was associated with the finding of a higher number of patients with zero score at entry in the study group (AS: 24/41; VS: 21/41) as compared with the control group (AS: 9/30; VS: 8/30) (Fisher's test for AS: P < 0.0173; for VS: P < 0.0257). Because of its popularity among the nephrologists and the high correlation coefficient with VS (r = 0.9995), we focused only on AS to examine CAC score progression. In doing so, we first observed that the prevalence of patients who showed any numerical AS change was NS in transplantation (25 of 41 patients, 60.9%; Wilcoxon sign/rank test = NS), whereas it was significant in dialysis (27 of 30 patients, 90%; P < 0.001). Second, we referred to the tables reported by Sevrukov et al. (22) to diagnose progression in every individual patient. Using these technically reliable criteria, we found that five of 41 transplant patients progressed (12.2%; 95% CI: 4.1% to 26.2%) as compared with 17 of 30 in the control group (56,6%; 95% CI: 37.4% to 74.5%) (Fisher's test: P < 0.0001). Finally, by using these same criteria and to evaluate whether the rate of progression was linked to the starting score value, we considered how many cases worsened exclusively among patients without substantial calcification at entry as identified by a basal, arbitrary AS value of < 15. As shown in Figure 2, two of 24 transplant patients (8.3%; 95% CI: 1.0% to 27.0%) and four of nine dialysis patients (44.4%; 95% CI: 13.7% to 78.8%) progressed (Fisher's test: P < .034). 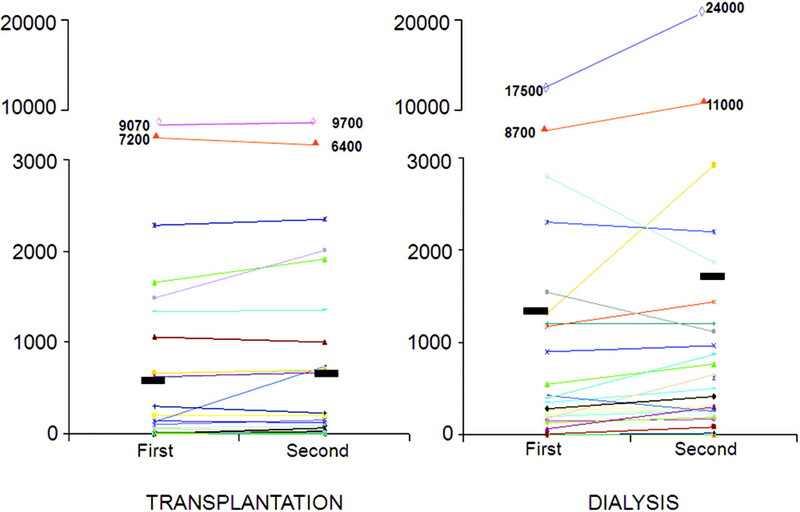 Interestingly, the same figure shows that the percentage of patients whose disease worsened, either in transplantation or in dialysis, were in the same order of magnitude as patients with a basal AS value >15: three of 17 transplant patients (17.6%; 95% CI: 3.8% to 43%) and 13 of 21 dialysis patients (61.9%; 95% CI: 38.4% to 81.9%) (Fisher's test: P < 0.007). 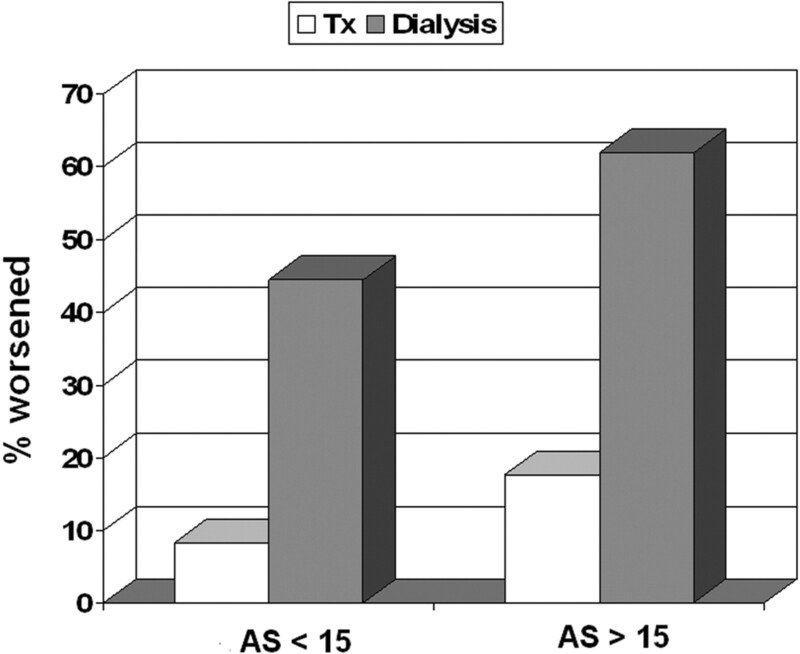 Percentage of patients showing progression of CAC, separately in transplantation and dialysis and according to different Agatston score (AS) values at entry (> 15 or < 15). On the basis of these results we can estimate that the yearly rate of CAC progression, among patients with basal values <15 or >15, averages 4.2% and 8,8% in transplantation and 22.2% and 31,0% in dialysis, respectively. Noteworthy, none of the patients in the study group showed a significant reduction of the score. Finally, with regard to both groups, no difference was evident in serum Ca and P, or in the use of vitamin D, between patients who experienced progression and those who did not. Given the potential clinical interest, we considered if it was possible to detect, with a multivariate statistical technique applied to our small sample population, whether any of the clinical or biochemical parameters were useful in predicting disease progression. We applied a discriminant analysis to the data, after splitting AS values into two classes: “progressing” or “not progressing,” according to the Sevrukov criteria. The most effective discrimination between progression and nonprogression was accomplished with (in order of importance) PTH values, the modality of therapy (dialysis or transplantation), and ESR (P < 0.00001). By using these three parameters, we were able to recognize disease progression with the following limits: sensitivity 73.3%; specificity 84.6%, positive predictive value (PPV) 63.6%, negative predictive value (NPV) 89.8%. Because of its complex pathogenesis, the issue of the rate of progression of CAC in the standard renal transplant patient is still unsettled. In our study, we tried to overcome any possible bias by selecting patients who had received transplants at least 6 months previous and who were predictably in a stable clinical condition and observing them for an average of 2 yr. Moreover, a clinically balanced control group was enrolled and restrictive, but technically adequate criteria to diagnose progression were adopted. By doing so, a limited and NS increment of AS (mean delta: +38; +5.7%) and VS (mean delta: +6; +1%) was observed in the study group. This increment is lower than any reported up to now (10–12), despite a longer follow-up. As a comparison, the control group had a substantial increment in CAC score, in the ranges that are typically described in this condition: AS +347 (+25.5%); VS +213 (+18.5%). Thus our data indicated that CAC progression is substantially affected or even halted in transplant patients. Moreover, when we considered progression of calcification in every patient by means of the Sevrukov criteria (22), a lower prevalence of progression was confirmed in the study group; nonetheless, a small but by no means insignificant 12.2% of the patients still experience disease progression. We did not expect to see progression in stable transplant patients without CAC at baseline; however, progression occurred in 8.3%, a rate not very different from that of recipients with elevated baseline CAC. By contrast, in the control group, the individual rates of progression were definitely higher in both subjects without calcification (44.4%) and in those already calcified (61.9%). A clinically relevant question is, Was the rate of calcification progression in our transplant patients abnormal? Data from a comparable population, balanced for age, gender, and ethnicity, but without CKD, are lacking. However, in a recent study involving a large number of community-based subjects who were asymptomatic for cardiovascular disease, the yearly incidence of calcifications was reported to average 6.6%, with values increasing steadily from <5% in those aged <50 yr to >12% in those aged >80 yr (26). Unfortunately, criteria for progression were not as restrictive as in our study, and CKD was not excluded; thus the possibility of overestimation exists. Nonetheless, the rate of CAC in our transplant population (predominantly male, white, and <50 yr of age) may well be within the rates observed in the general population. Our results are partially in agreement with available papers on CAC modification after renal transplantation, which, however, are insufficient and not uniform. Moe et al. (10) used MSCT to study 23 patients within a few days of transplantation and then 15 to 20 mo after. They describe stabilization of the score (actually +77 ± 246, statistically NS) which was definitely at variance with the increment observed in the 17, regrettably unmatched dialysis controls (+489 ± 697). All subjects with a baseline zero score, either in dialysis or transplanted, did not progress. Oschatz et al. (11) similarly used MSCT to study 31 subjects immediately after surgery and then after 6 and 12 mo, with no control group. They showed an increment of coronary calcium at the first control (+200 on average) and stability thereafter (−26) and, again, no new calcification. In these studies, as compared with our protocol, a lower number of cases and a shorter follow-up were used; in addition, the issue of progression was mostly considered in the whole population and not in every patient. More recently, Schankel et al. (12) used EBCT in 82 incident transplant patients, who were re-evaluated again after at least 12 mo, and again with no control group. The absolute increment of CAC (+83 ± 241) was reported to be significant, and with a fixed and arbitrary cut-off value set at ± 25% of the baseline scan, progression is described even in 11% of the cases who had a first score of zero. However, as outlined before, this fixed threshold is not ideal, especially in the presence of low score values, for which higher percent repeatability limits are now recognized. The aim of all these studies was to evaluate the impact of renal transplantation on the high rate of CAC progression observed during dialysis; therefore, incident transplant patients were enrolled. However, the early months after graft placement are characterized by significant biochemical, clinical, and therapeutic shifts, such that either a positive or a negative effect on vascular calcification can be theoretically anticipated. This could explain some of the discrepancies (increment or stability) that are evident in the above-mentioned studies. To our knowledge, our study is the first to use stable patients, a relatively long follow-up, a clinically balanced control group, and technically reliable criteria to recognize modifications of CAC scores in the individual patient. Therefore, it is also the first to observe that CAC progression is affected but not halted with successful transplantation. In addition, our data indicate that an improvement of coronary calcification is a very rare occurrence (actually none in our study group), allowing us to affirm that, once established, coronary calcification will hardly regress after transplantation. Another result in our study is the possible link of the condition of progression with secondary hyperparathyroidism and inflammation. In fact, during the 2-yr interval, our transplant patients showed an improvement in the biochemical parameters of secondary hyperparathyroidism, possibly explained by the extension of the follow-up (7,27), which is expected to favorably affect calcification (28). They also showed an increase in serum fetuin to normal levels, indicative of lower inflammation but also of increased calcification inhibition capacity of plasma (5). However, the rise of OPG levels could be regarded as an increased risk for calcification (9,29). However, although significant, the increment of OPG was limited and characterized by values always definitely lower than in the control, calcifying group. Finally, at the time of enrollment, our populations were balanced for the most important risk factors of vascular calcification (age, gender, dialysis duration, diabetes, and cardiovascular diseases), but not for the severity of secondary hyperparathyroidism and inflammation. In fact, they had different baseline CAC scores. As a whole, these data are in agreement with the results of discriminant analysis, linking CAC progression with PTH and ESR, together with the condition of dialysis or transplantation. We can then speculate that only the contemporary control of inflammation and of secondary hyperparathyroidism may significantly increase the chances of affecting or possibly halting CAC progression in uremia. The limitations of this study are the relatively low number of patients considered and the enrolment of a “balanced” rather than a perfectly “matched” control group. In fact, to obtain more significant results, we should have evaluated the rate of calcification progression in the same patient both before (during dialysis) and after transplantation. Nonetheless, although further studies are welcomed, the differences we observed had consistent statistical strength. We conclude that renal transplantation favorably affects but does not halt the CAC progression typical of dialysis. Importantly, when this phenomenon is evaluated in individual patients, it is necessary to refer to technically validated criteria, and in this case, sampling intervals of at least 2 yr seem adequate. Moreover, to increase the probability of affecting or possibly halting progression, both inflammation and hyperparathyroidism must be kept under control. Data of this study have been presented at the XLV ERA-EDTA Congress held in Stockholm on May 10 to 13, 2008.